"Remember the eisteddfods we used to take part in at the Monument?" I said to my brother who has been living out of South Africa for more than 30 years. "Well it's nothing like that." You don't need to have grown up in Grahamstown to appreciate the extraordinary creative talent and energy on show at Masicule 2017. But for contrast, it's difficult not to compare our days of staring down at our pale legs and black lace-ups while we did our best to recreate the life and times of Saint Thomas Aquinas with a tentative version of Cesar Franck's Panis Angelicus. Masicule 2017, a real show with professional sound and lighting, gets you from the word go, as voices from Graeme College, Kingswood College, St Andrew’s College and Diocesan School for Girls, Victoria Girls' High School, Nombulelo High School, Ntsika Secondary School, Kutliso Daniels High School and Nathaniel Nyaluza High School, fill the stage, gallery and sides of the auditorium in live surround-sound with the event's anthem, the traditional Xhosa Yele Yele Masicule! (Let's Sing!) conducted by Bhoki Saki. If that doesn't stir your South African soul, you may as well be dead. What follows is a more or less seamless production. Actually there are seams, clowned over by well known Grahamstown actors Ayanda Nondlwana and Sisonke Yafele, whose licence to take the p...s makes sure you aren't completely overawed by world-class moments. It's difficult to pick highlights from a show in which every item deserves to be there. But of the small groups, Signature Sound stood out for ensemble excellence in their rendering of Zahara's Loliwe, as did Sensational Six in Bhoki Saki's arrangement of Indzima le ndlela. The all-male group Vox provided the perfect foil for soloist Sebastian Jamieson in Lauren Hill's His Eye is on the Sparrow. Of the full choirs, Nombulelo singing a medley of Afrikaanse volkswysies was the first big hit. 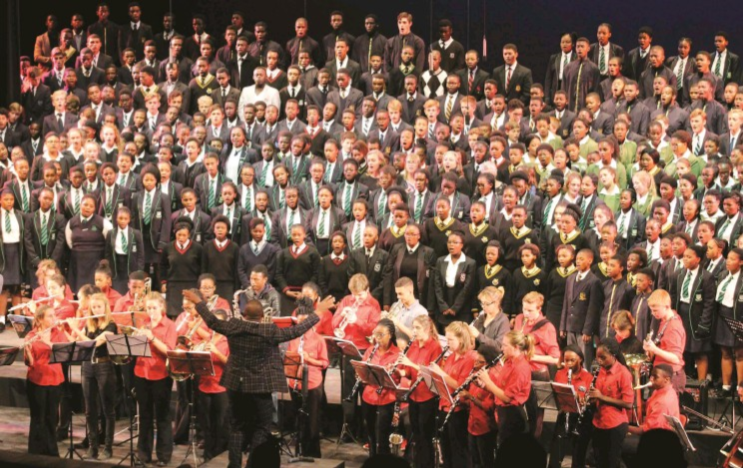 The Kingswood College Senior Choir's 'Fees Must Fall 2016' version of Enoch Sontonga's Nkosi Sikelel' iAfrika also raised the roof. The highlight of the show, though, had to be Victoria Girls' High School's spine-tingling rendition of Karl Jenkins's Adiemus. And it's not just the special version of the Mexican Wave that brings the phrase World Cup to mind. To say that award-winning Asanda Mqiki was a bright star in the show, but not the only one, is not to detract from her powerful voice and matching stage presence. She sings Mackay Davashe's Lakutshona ilanga, and Fever. This is the fourth edition of Masicule, organised by the National Arts Festival under the Creative City bannner. The finale of the 90-minute spectacle is the Hallelujah Chorus from Handel's Messiah, performed by the combined mass choir and accompanied by the Kingswood College Concert Band. Musical Directors are Priscilla Glover and Access Music Project’s Gareth Walwyn. The concert has the support and expertise of the National Arts Festival’s production team behind it. “We’ve bought in some great lighting designers and the best sound team we could find. That, together with a freshly built set on the magnificent Guy Butler Theatre stage add up to a wonderful production,” Lankester said. Your last chance to experience Masicule 2017 is tonight Monday 20 March at 7.30pm. Tickets – at R40 for adults and R20 for learners, pensioners and students – will be sold at the door or, ahead of time, from Makana Tourism Office; Access Music (Extension 6 Joza Hub); Fusion (Pepper Grove); and the National Arts Festival Office (Monument). Tip: Get their early for a good seat in the auditorium. You're free to skip the next part in which the writer attempts to make the tenuous link between the introductory paragraphs, and what actually happened at the first Masicule 2017 performance yesterday. This isn't a Grahamstown to be awkward or tentative about. An audience-neighbour said at the end, shaking her head, "Grahamstown has talent - no really!" She really meant it. So did the performers. As for the brother, he was blown away. Okay, here's the part you definitely should skip. Thirteenth Century philosopher Thomas Aquinas in speaking about the "substantial form" of the soul: it exists separately from the body. Roughly, following Aquinas's theory, it's the soul that makes human beings what they are. Matter (your body) and form (your soul) are separable, Aquinas held, and so just because you have a human body doesn't make you human: the soul is what makes you human. Yip. Grahamstown has a soul. As if you didn't know.